Education Department of Ceylon University in 1957 was shifted from Colombo to Peradeniya as a Department in the Faculty of Arts of the Ceylon University. After Prof Green, JEJ became the First Ceylonese Professor of Education of the Ceylon University. 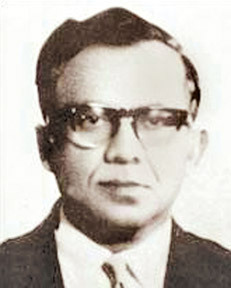 JEJ functioned as Professor of Education and Head of Education Department from 1957-1971. He also served as the Dean, Faculty of Arts, Ceylon University, Peradeniya during the period 1964-1965. The prestigious position JEJ held in Peradeniya enabled him to introduce the Bachelor of Education (B Ed) Course and to experiment with several new ideas pertaining to teacher training at a time when Education Policy-makers were paying scant attention to the professional development of teachers. Teachers with B Ed degree and/or Post-Graduate Diploma in Education who were privileged to be his students still remember and speak with gratitude Prof Jayasuriya’s remarkable ability in presenting and discussing complex psychological concepts and theories and different methodologies in educational evaluation and measurement in a very simple and interesting manner and showing their relevance to life as well as to teaching-learning activities. Many of his students who are presently holding senior academic and executive positions and diplomatic assignments perform exemplary services in their relevant fields with commitment and dedication keeping up the high ideals inculcated by him. The series of 12 Sinhala medium books JEJ wrote and published in the 1950s to present the subjects Arithmetic, Algebra and Geometry in a simplified manner to students and teachers of Grades VI-IX under the titles Ganitha Navodaya, Veeja Ganithaya and Seegra Jyamithiya were the most popular Mathematics books in schools for nearly two decades until the advent of New Mathematics. New Approach Arthmetic (Grades VI-VIII), Kumara Buddhi Pareekshana (Grade V) and Adhyapana Vidya Lipi (1974) are three other publications of JEJ. In March 1961 Prof J E Jayasuriya was appointed as the Chairman of the First National Education Commission (NEC) which comprised 20 members including Dr C W W Kannangara and L H Mettananda, S Natesan, T Vimalananda, S H Perimpanayagam, D T Devendra, K L V Alagiyawanna and A D V De S Indraratne. The Commission was requested to examine and make a comprehensive review of Ceylon’s entire educational system and make recommendations for the establishment of a unified national system of education with special reference to the organization, grading and classification of schools. The NEC submitted an Interim Report under 21 heads in October 1961 and the Final Report under 33 heads in July 1962. The report mostly authored by JEJ himself recommended far reaching changes in many areas of the education system. It has been a model for similar exercises in many other developing countries. The NEC found that no legislation existed in Ceylon at the time making education compulsory for all children between the ages of five to 14 and recommended that legislation be enacted defining the compulsory school age. However, compulsory education was legalized only in 1998. Among the other recommendations are: admission of children of five years to school, making Sinhala and Tamil as media of instruction, introduction of English as an optional subject from Grade V, making schools co-educational in character, provision of a Basic eight year Junior school (Kanishta Vidyalaya) consisting of a lower division (Grades I-V) and an upper division (Grade VI-VIII) and a network of four types of Senior schools (Jyeshta Vidyalayas) for education beyond Grade VIII giving opportunities for students to develop their special interests. The types of schools (A, B, C and D) recommended were: A for students with an interest in Agricultural studies, B for the field of technology, C for pure science studies and D for humanities or commercial studies. It was suggested that pupils finishing Grade VIII be advised in their choice of schools by making available to them and their parents full details regarding the courses of study provided in the different types of schools, the occupational opportunities to which they open the doors and the facilities for more advanced studies at the university level for those who qualify in due course for such studies. The problem of curricular diversification received the active attention of the NEC which achieved unanimity among its 20 members on this vital issue. The curriculum recommended for Grs. VI-VIII was: Religion, Sinhala/ English/ Tamil, Official Language, Elementary Mathematics, General Science (including Health Science), Ceylon and World History (Grs. VI-VII) and Ceylon Geography (Gr. VIII), Civics (Gr. VIII only), Art, Physical Education, Wood Work or Metal Work for boys, Home Science for girls and Work Experience (a period or day in school garden or paddy field or practising at school a cottage industry prevalent in the area.) The unit of zoning recommended at the senior school level was the electorate each of which to be entitled to a quota of Senior schools. The scheme of zoning advocated was to ensure that every school would serve all the children in a given geographical area and that no test of economic status or religious affiliation would be applied in the matter of admissions. Prof W Ariyadasa de Silva in delivering the eighth JEJ Memorial Lecture in 1998 on the subject ‘A case for Professionalisation of Secondary Education in Sri Lanka’, after a detailed analysis of the Jayasuriya Commission Report observed the ‘it should reflect very creditably on the NEC that it anticipated the recommendations of the Delors International Commission by exactly 35 years as far as Sri Lanka was concerned’. Learning: The Treasure Within, the Report to Unesco of the International Commission on Education for the 21st Century chaired by Jacques Delors was first published in 1996 by the Unesco, Prof de Silva added:’..... The recommendations of these two commissions are so similar, almost identical, that one may quite easily look upon the Delors International Commission as a reincarnation of the J E Jayasuriya Commission’. He started his comments by confessing: ‘as it was my privilege to be the Chairman of the NEC, a commitment on my part to many of the NEC Recommendations is to be expected. However, it is my hope that this bias may have been balanced by my conviction that there can be more than one solution to an educational problem: and that the NEC was by no means in exclusive possession of the best solutions’. It was JEJ’s view that W P departed from NEC recommendations on some vital and crucial issues. He concluded: ‘the purpose of this analysis was to examine the implications of the proposals for education in the White Paper, especially the implications that are hidden under a sugar coating of facile phraseology (eg regarding the provision of schools, co-education at the post-Basic stage) and to focus attention on the limitations of the proposals from the point of view of planning a rational system of education that would on the one hand bring a good education within the reach of every child, irrespective of the economic condition or the social status of his/her parents, and on the other hand gear education to the economic needs of the country’. JEJ added: ‘one of the most disquieting features of the White Paper is that by and large it stands for the maintenance of the status quo, with the minimum disturbance to the interests of the well-to-do parent. No other explanation is possible of the way in which some of the NEC proposals, as for example, the proposal on the zoning of schools, have been rejected or rendered ineffectual....I find in all sincerity that almost every departure in the White Paper from the NEC recommendations is a departure for the worse’. Although the 1964 W P was tabled in Parliament the government was defeated before a discussion on it could take place. The NEC report was also put into cold storage as with every proposal, project and concept that is good and productive for the country.